Rush Limbaugh and his long time girlfriend, Kathryn Rogers, 33, were married at the Breakers hotel, which is located in Palm Beach. They were wed in front of a crowd of around 400 people. 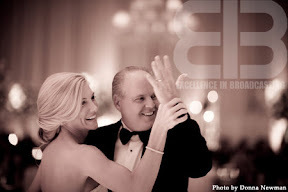 According to some reports that were released in the wake of the wedding, the celebration cost Limbaugh over $1 million. Elton John entertained the crowds during the reception. Some sources have stated that John could have received as much as $1 million for the very private performance. Other celebrity guests that attended the wedding include Fred Thompson, Sean Hannity, Karl Rove, Tom Watson and Rudi Giuliani. Rogers and Limbaugh reportedly met one another when they took part in a celebrity golf game several years ago.